Tuition and fees are set by the Washington State Legislature. Current tuition and fees may be found on the Registration and Records website at registration.highline.edu/tuition.php. Miscellaneous laboratory fees that relate to specific classes are listed in the current class schedule. Tuition and fees are due in full on the dates published in the quarterly class schedule and online at registration.highline.edu/calendar.php. For tuition purposes, a resident is a US Citizen, US Permanent Resident, US National or holder of a visa status that has been approved as eligible. Those with official status as refugees, asylees and parolees are also eligible. Eligible individuals must demonstrate a history of presence as well as indicate intention to remain in Washington State for purposes other than education. Detailed information is available online at admissions.highline.edu/Residency.php. Current tuition rates are published in the quarterly class schedule and are available online at registration.highline.edu/tuition.php. For financial aid, other funding agency or insurance benefits purposes, full-time status is considered 12 credits or more. *Non-resident waiver applicable to U.S. citizens and U.S. Citizenship and Immigration Services-approved permanent residents. **There is an additional charge for each credit hour enrolled above the 18-hour full-time rate. Professional-technical program students enrolled in more than 18 credits during a specific quarter will not be charged in excess of 18 credits for courses required for their degree or certificate. Current fee rates are published online at registration.highline.edu/fees.php. Further information specific to International Students may be found at the International Student Programs office or at international.highline.edu. Building Fee: A per-credit fee assessed at the time of registration. This fee was established by a vote of the students to cover costs of the Highline Student Union and is assessed at the time of registration. Placement Test: COMPASS, ESL COMPASS, and MyMathTest are computer placement tests. Fees vary. 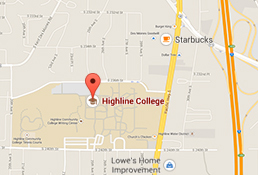 For information, visit the Placement Testing website at placement.highline.edu. Instructional Technology Fee: A fee assessed for students enrolled in computer-related courses. Late Course Add Fee: Students will be charged a late-add for each course added after the published payment deadlines. See “Important Dates” in the quarterly class schedule or visit registration.highline.edu/calendar.php for the last day to enroll without incurring this charge. Parking Fee: Permits are required to park on the college campus. Students may purchase a parking permit at the Campus Security office or at the Cashier window, both located in Building 6. Fees are published online at campussafety.highline.edu/parkingpermits.php. Purchasing a parking permit does not guarantee a parking space. Photo Identification Fee: A photo identification card is free with a student’s enrollment into the college. Students will be charged for replacement cards. Transcript Fee: There is a charge for each official transcript copy requested. Allow up to 7 business days to process each request. Unofficial transcripts are available free of charge online at https://secure.highline.edu/wts/student/waci002.php. In order to meet educational needs not supported by state funding, Highline offers some courses financed solely by student-funded (self-supported) payments. Enrollment in these courses requires payment, over and above regular tuition and fees. Contact Continuing Education at (206) 592-3785 or ce.highline.edu. Enrollment must take place the second week of the quarter on a space-available basis. A maximum of two classes per quarter may be taken. An instructor’s signature is required on an add/drop form, which must be taken to Registration for processing. This waiver is not available to students who plan to use the course credits gained thereby for increasing credentials or salary increases; course credits taken under the waiver do not apply toward any certificate or degree and enrollment is audit based. Current senior citizen tuition rates are published in the class schedule or contact Registration and Records for further information. There is a nominal charge for noncredit Adult Basic Education (ABE), English as a Second Language (ESL) and GED preparation classes. Waivers are available for students who are unable to pay. All requests to withdraw from classes must be received by the Registration office. Students may withdraw from a class via Web registration or at the Registration office. Tuition and fee refunds are issued according to the schedule published in the quarterly class schedule or visit registration.highline.edu/calendar.php. Refunds require three weeks to process. Students receiving any form of financial assistance must consult with the Financial Aid office to determine the appropriate refund amount. Refunds for these courses will be computed on the basis of the number of instructional hours offered before withdrawal documentation is received in the Registration office. If the number of instructional hours offered is equivalent to five instructional days or less of the regular academic quarter, 100 percent of the amount paid will be refunded. When a class is canceled by the college, the total amount paid for that class will be refunded unless the student enrolls in a replacement class. If the replacement class is for fewer credits than the canceled class, the difference will be refunded.